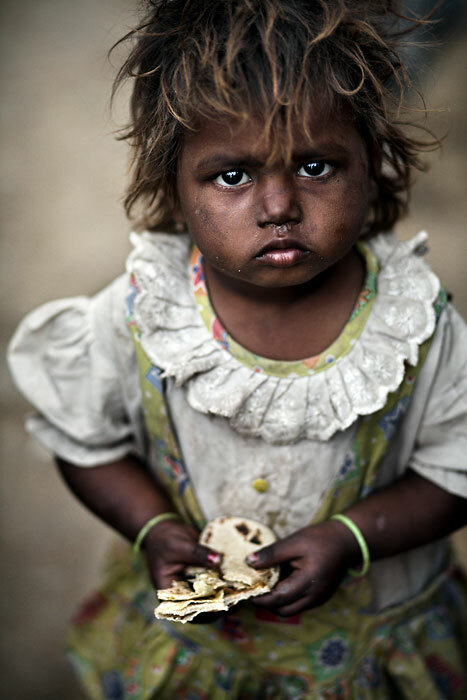 This was taken at a squatter camp in Delhi, India. The whole settlement seemed to be focussed around taking large hammers and breaking rocks with them. I saw old men, adults and children all taking part. I took a stroll through the tents and shacks and found this girl. Eventually I had to leave because I had a heap of children following me and the boss of the rock smashing said I was distracting the people from their work. That is a completely incredible photograph. Further superlatives fail me. Message edited by author 2007-03-23 18:53:32. This is one of my faves that you took in India. Great DOF, she is so cute. Wonderful work! You fall into the spell of her eyes. Message edited by author 2007-03-23 15:25:55.
send me into depths of despair with this brilliant shot. This is staggeringly good. The entire body of high quality work that you've managed to compile at such a young age is impressive, to say the least. What a future you have. Very impressive, love the colors and DOF. Great shot, great story. One of the most moving portraits I've ever seen. Worthy of a Nat'l Geographic cover. Wonderful work. You connect with them, which makes us see it through your eyes that much more. Proudly hosted by Sargasso Networks. Current Server Time: 04/21/2019 02:26:40 AM EDT.